Dark Horse announced today that two of the hottest names in comics, writer Fred VanLente and artist Ariel Olivetti, will reunite for a Conan epic like no other! In Conan and the People of the Black Circle, a four-issue miniseries set a decade after the current Conan ongoing series, fans will find Conan like they’ve never seen him—fully painted by Olivetti! Assassins, dark magic, and a beautiful noblewoman mean trouble for the Cimmerian barbarian unlike he’s ever seen in this full-tilt escapade through the mountains of Afghulistan! 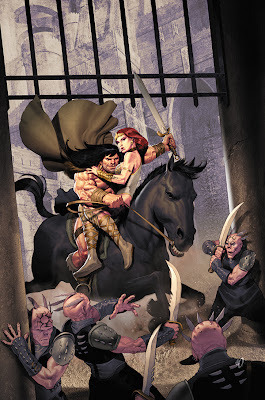 With The Legend of Conan in development with Universal Studios, Dark Horse’s Conan is essential reading. Conan and the People of the Black Circle #1 is on sale October 16 in comic shops everywhere.